Why BSc Computational Finance and Financial Technology? The BSc in Computational Finance and Financial Technology major has 2 streams, namely (1) Computational Finance Stream and (2) Financial Technology Stream. Students could also opt for not following the above streams in taking courses. Computational Finance stream is an interdisciplinary stream offering a comprehensive curriculum that covers state-of-the-art training in finance, mathematics, statistics and computer programming. The integrated application of these four areas is in great demand by today’s financial markets. 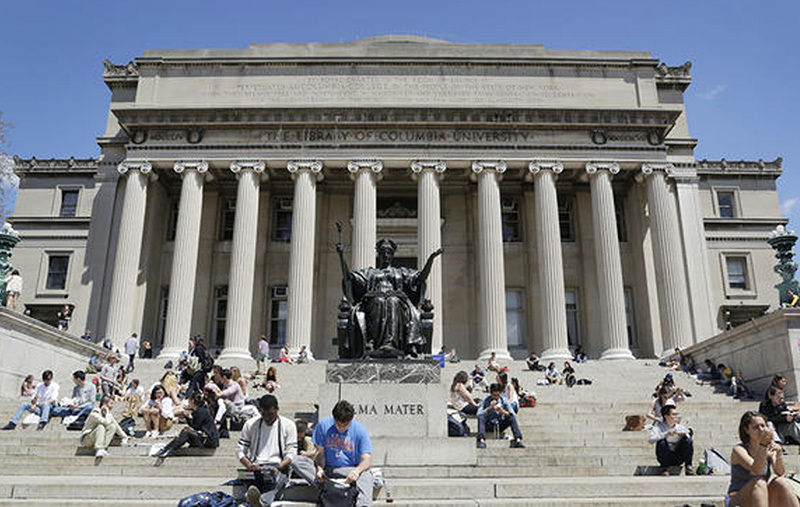 Computational Finance stream students have the opportunity to apply for admission to the Joint Bachelor's Degree Program between City University of Hong Kong and Columbia University. Upon completion of this joint degree program, students will receive the dual awards conferred by Columbia University and CityU. Financial Technology stream gives students an interdisciplinary education in business, information technology, and innovation by training them in mathematics, statistics, programming, information systems, and finance. The FinTech core courses include blockchain, big data, cybersecurity, regulatory technology (RegTech), Python programming, machine learning, technology entrepreneurship, and Fintech capstone project. 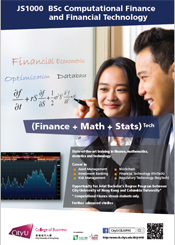 Why BSc Computational Finance and Financial Technology at CityU College of Business? Computational Finance stream provides comprehensive training and internship opportunities to prepare students to establish competitive advantages in financial careers such as asset management, investment banking and risk management, as well as further advanced studies. Financial Technology stream prepares students for graduate studies in business and careers in the emerging FinTech industry that require solid technology training and finance domain knowledge. - Besides Category A elective subjects, Mathematics extended modules (M1/M2) and “other languages” (at grade E or above) can also be used to meet the elective requirement. If students take both M1 and M2, they are counted as one subject only. - Applied Learning subjects are not counted as elective subjects. - For details of the alternative Chinese Language qualifications acceptable by the University for Non-Chinese Speaking (NCS) students, please visit http://www.admo.cityu.edu.hk/jupas/entreq/bd. - cultivation of social responsibility through community services and voluntary work. Q. What are the unique features of this major? A. Students will acquire the knowledge and skills to meet the demand of today’s financial markets in four key domains: finance, mathematics, statistics and computer programming. Q. What is the admission quota? The total quota is 10 (for both JUPAS and non-JUPAS admissions). We admit the top students locally and globally. Q. Do I need to attend JUPAS admission interview? A. Yes, for shortlisted applicants only, an interview will be scheduled around June. Q. Can I take a minor? A. Yes, you can customise your own Computational Finance and Financial Technology study plan with your minor of interest (subject to fulfilling the requirements of declaring a minor).